With all the seriousness that we treat life, sometimes we need something to makes us smile and laugh. Here is an article that I just saw and thought that would interest you!! Of all travel problems, this one stinks most. Many travelers complain about an increased need to fart on planes, or, less commonly, feeling bloated while flying. If this sounds familiar, you’re not alone: There’s a scientific name for this scenario. HAFE stands for High Altitude Flatus Expulsion. Coined by a pair of researchers in the 1980s, the “tongue-in-cheek” term describes a phenomenon observed when mountain climbers experienced flatulence at high altitudes, said Dr. David Shlim, a physician and former president of the International Society of Travel Medicine. Turns out HAFE is likely at play when you pass more gas on a plane. Airplane cabins are pressurized to between 6,000 and 8,000 feet, which is a significant altitude change for your body if you’ve come from sea level, Shlim told HuffPost. And just as the air in your water bottle expands at higher altitudes, the gas in your intestines can expand on a plane, growing to take up about 30 percent more room than usual. Then, it needs to escape. Expanding gas can also lead to feelings of bloat, Kalish says, though he said he doesn’t hear that complaint often. If feeling gassy or bloated is an in-flight problem for you, there are ways to help prevent it. Drinking water is always a good idea, especially when you’re flying, and avoiding salty and fatty foods helps combat bloating. Dr. Marvin Cooper, a travel medicine physician in Manhattan, recommends walking around the plane to “shake up your bowels a bit,” he told HuffPost. Kalish says an over-the-counter anti-gas medication should ease discomfort, too. Oh, and let your farts out, even if it’s awkward. 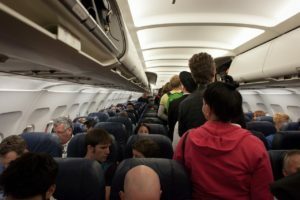 In a 2013 paper on in-flight flatulence, researchers from the University of Copenhagen noted that holding back a fart can lead to discomfort, pain and more bloating. Over time, the habit could also increase your risk of colonic diverticular disease, an inflammation of the colon. Bottom line: Let your farts fly when you do, and all will be fine.